I kept an eye out for other recognizable locations; however the movie is so hyperactively edited that my eye could not settle on any before the next cut. Nevertheless, I smiled, and immediately began thinking of my wonderful trip to Guanajuato that took place three years ago this month! I was still living in Los Angeles when I decided to meet my then-girlfriend in Guanajuato for a few days. United Airlines had recently launched a daily non-stop red-eye flight from LAX to BJX – Del Bajío International Airport, serving León and Guanajuato, both located in Estado de Guanajuato. I landed in Mexico at 5 a.m. and was first in line at passport control, which hadn’t even opened for the day! I would bet that getting from the airport to central Guanajuato by bus would be a 90-minute journey. By taxi, however, it was just 35 minutes. 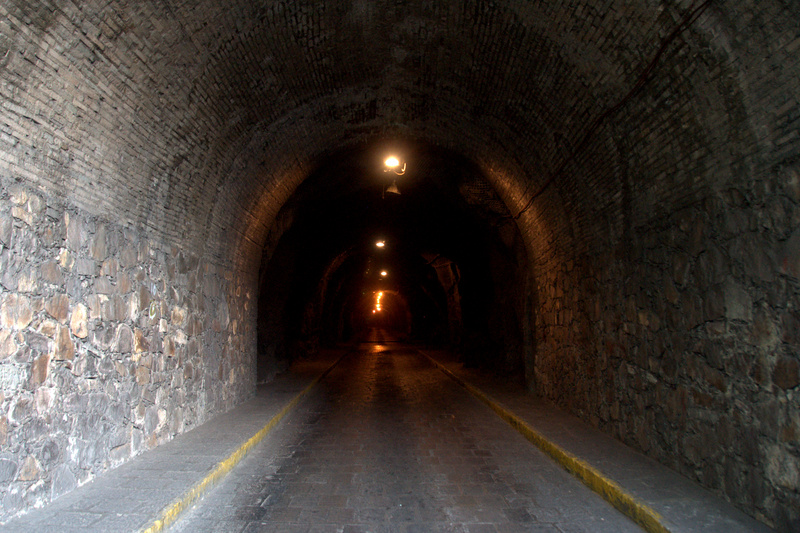 Though still dark, arrival into Guanajuato was marked by passing through a series of remarkable tunnels, all earthquake-proof and blasted into the city’s notoriously-steep hillsides. The dopey, disinterested front desk staff at Hotel Mesón del Rosario, my pre-chosen budget hotel, seemed a bit surprised by my 5:45 a.m. arrival. They let me check in early, uttering barely a grunt of welcome and being clearly more interested in whatever telenovela was airing on TV. The hotel was okay, though. The lobby featured knights in armor, and the hotel itself was conveniently located on the main road, a ten-minute walk to various points of interest in any direction. I didn’t get much sleep during the short flight, and relished the opportunity for a nap. I awoke two hours later refreshed, hungry, and ready to take on the city. A pleasant square around the corner from the hotel was lined with restaurants. Each restaurant employed attractive young señoritas to wave menus and solicit customers. In my hunger, I opted for the first restaurant that I came across, and it was a place that I dined at for three of the next four days as well. Café de la olla – black coffee served inside a clay pot – was a new treat for me, and it went great with my order of huevos con jamón, my favorite Mexican breakfast dish. 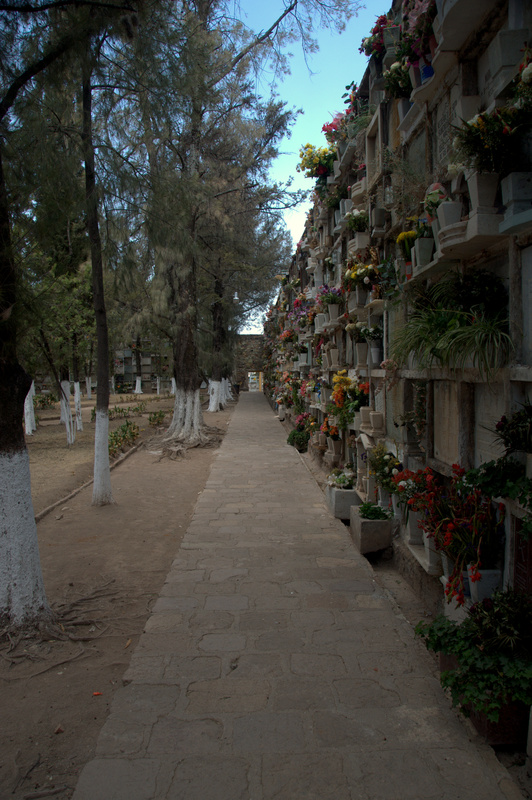 I set out towards the city’s top tourist attraction, the Museo de las Momias (Mummies Museum). 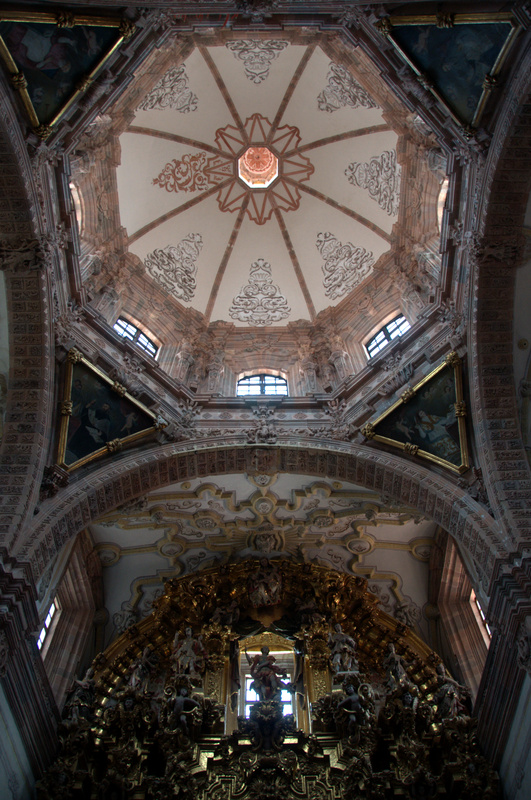 A long, uphill walk deposited me at the entrance to an impressive mausoleum, the city’s Panteón Municipal. 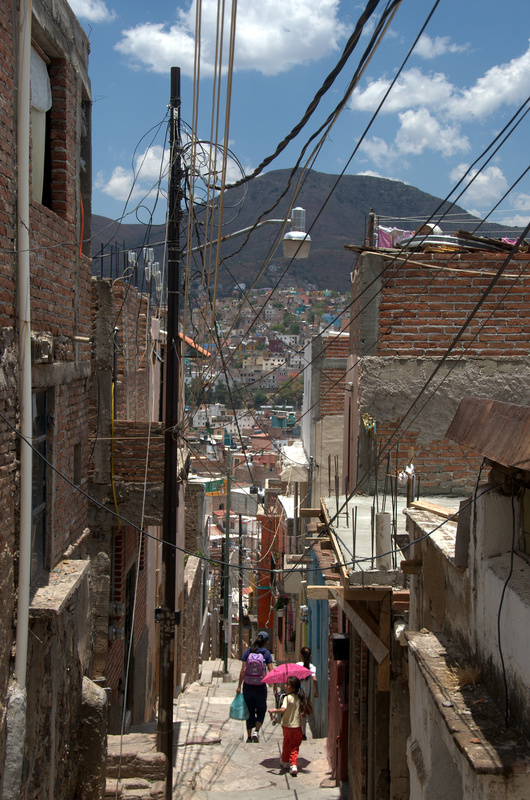 In an example of the contrast typical to Mexican cities, the imposing entry gate was in front of me while a lower-income barrio descended the hill behind me. The museum itself was on the opposite side of the cemetery complex, and it is just as well that photography was not allowed inside the museum, because I would have burned through 100 photos easily. ¡Muy miedo! Approximately 100 mummies – victims of a cholera epidemic that struck Guanajuato in the mid-1800s – are disinterred (mummified) within. Leathery skin, wrinkly genitalia, and lengthy fingernails (nails continue growing for some time after a person dies) are on full, creepy display. I have seen creepy things on my travels before – a wall of skulls deep inside the Paris Catacombs and a horrifying torture museum in San Gimignano, Italy, among others – but the Mummies Museum of Guanas takes the top prize. The next morning, we enjoyed more café de la olla and discussed our sightseeing plans. 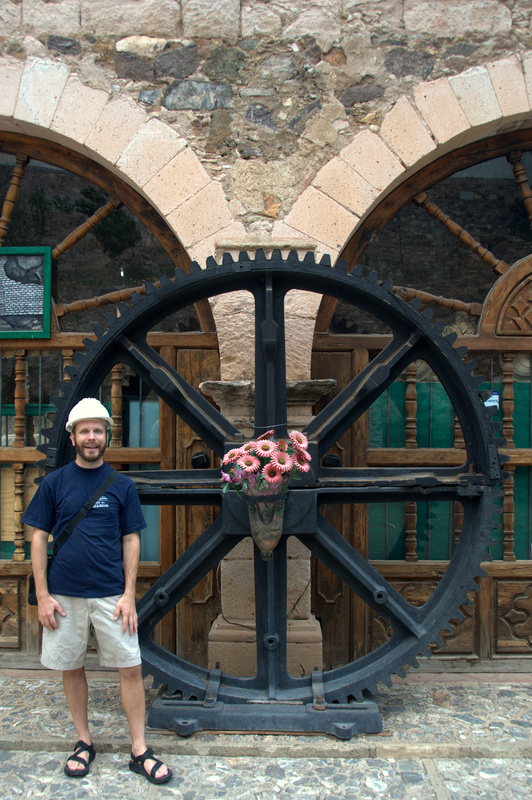 Most of Guanajuato’s sights are within walking distance, but we were most interested in visiting one of the city’s still-operating silver mines. We decided on one that was perched on a mountainside in the northern outskirts of the city. This mine, La Valenciana, gives regular guided tours (hard hats required). Although we were exposed to accumulated gold and silver deposits on the walls of the mine as we descended, the tour was short and somewhat kitschy. We didn’t see any actual miners – just cheesy sculptures of miners. Not quite sated, we decided to check out a different vantage point. Following a ten-minute down a quiet street, an imposing entrance gate marked our arrival. This surface-level section of the mine was a different experience in that we got to see the mine shafts and riggings from above. There weren’t any visible excavations going on, however, so the whole place had a creepy, abandoned feel to it. Before heading back into town, we peeked inside El Templo de San Cayetano, a magnificent church (with a pink façade) that also marks the bus stop for tourists to disembark for La Valenciana. The remaining days were spent with no agenda except to take in Guanas and all that it had to offer. We enjoyed lengthy wanders through the twisting city streets, popping into many churches that we passed along the way, including the stupendous cathedral. 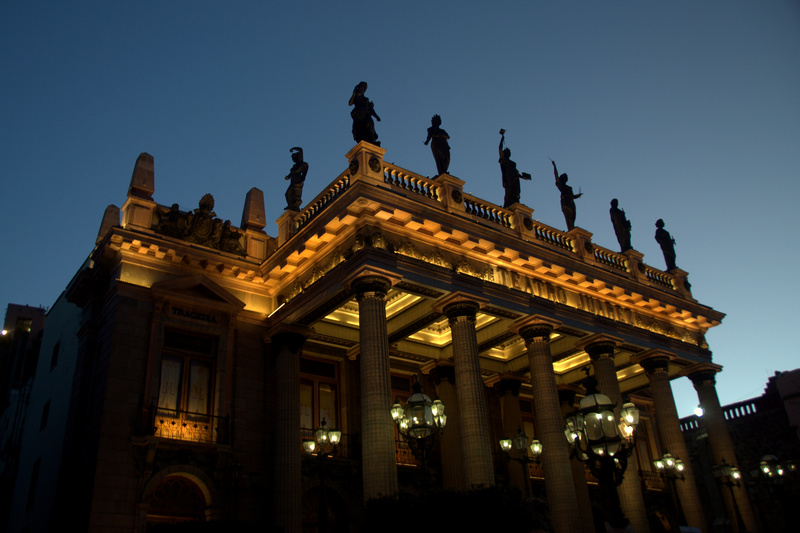 We toured the inside of the baroque Teatro Juárez, and visited the museum and former home of Diego Rivera. One evening found us riding the funicular to El Pípila, a monument to local independence hero Juan José de los Reyes Martínez, colloquially nicknamed “El Pípila” for his freckled face. Another evening found us sipping take-out coffee on the steps of the historic Alhóndiga de Granaditas (grain storehouse). We were sure to book a spot on one the city’s famous Callejoneada tours. A sort of “walking serenade,” the Callejoneada is a musical tour during which university students, mostly men, dress up in 17th-century attire and parade interested participants through the city streets while narrating – often musically – a series of local legends. 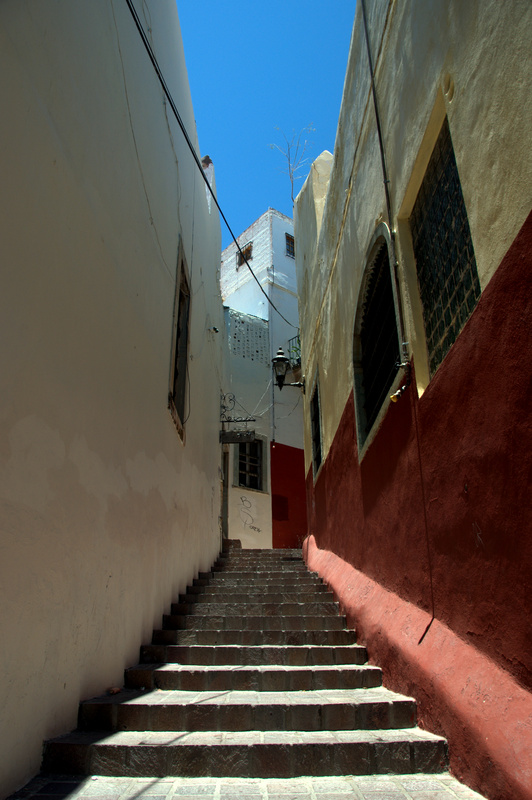 Some of the stories are romantic in theme, and the tour passes through narrow Callejón del Beso – Alley of the Kiss – before concluding on the university steps. 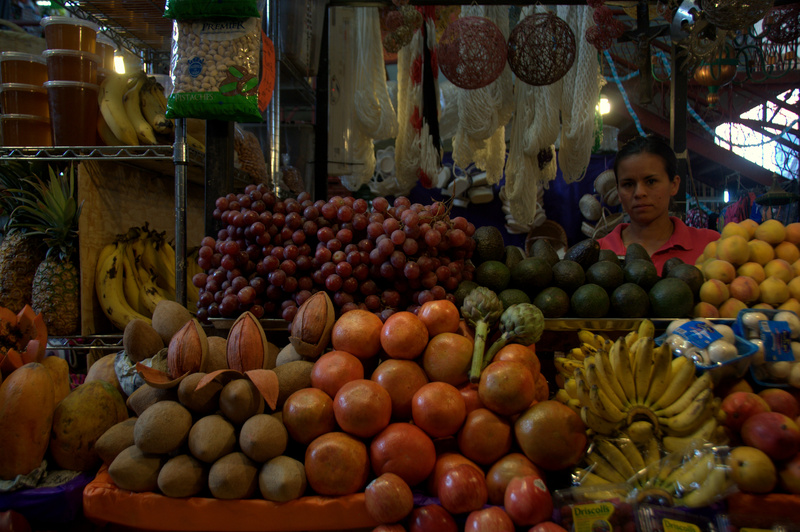 Although the Callejoneada is a Guanas tradition, its popularity has grown to the point that it can now be found in other colonial cities as well. 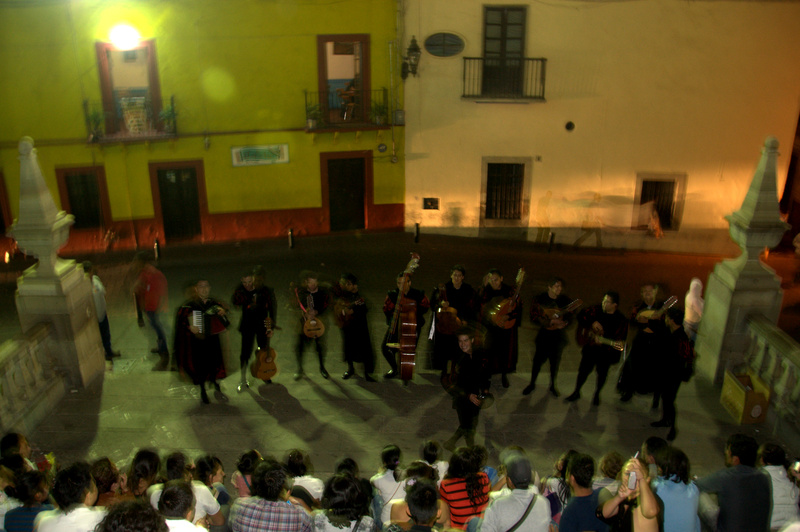 Even faraway Oaxaca is said to participate in the Callejoneada procession. 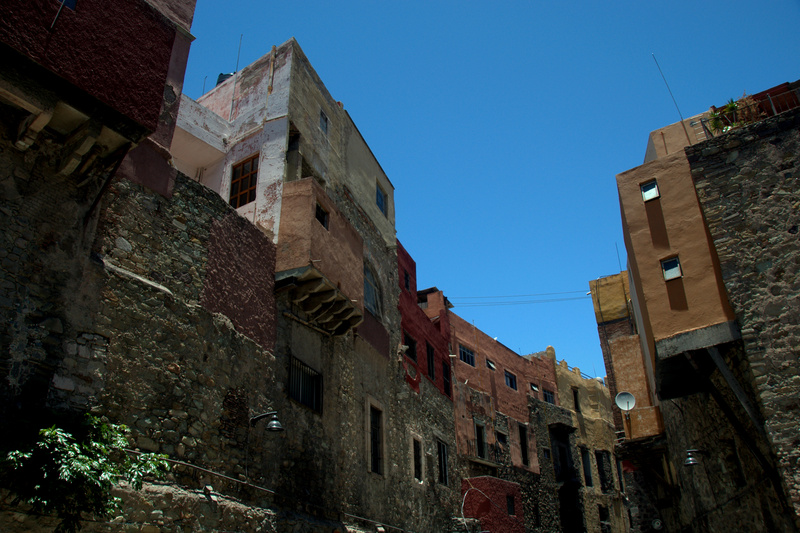 Much of the fun of a visit to Guanajuato lies in simply getting lost. 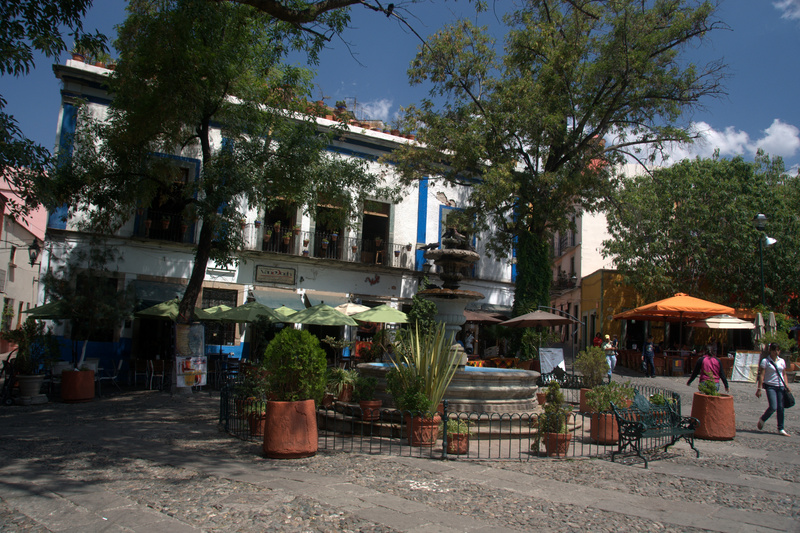 The main road, Avenida Juárez, winds for considerable distance through the center of town, but casual strolls that venture off of this road are rife with pleasant discoveries. One day we discovered a cobblestone, lower-level street that was flanked by architecture more at home in Andalusia or Tuscany than in Mexico, and the cloudless sky during that particular walk only heightened the Mediterranean Europe vibe. 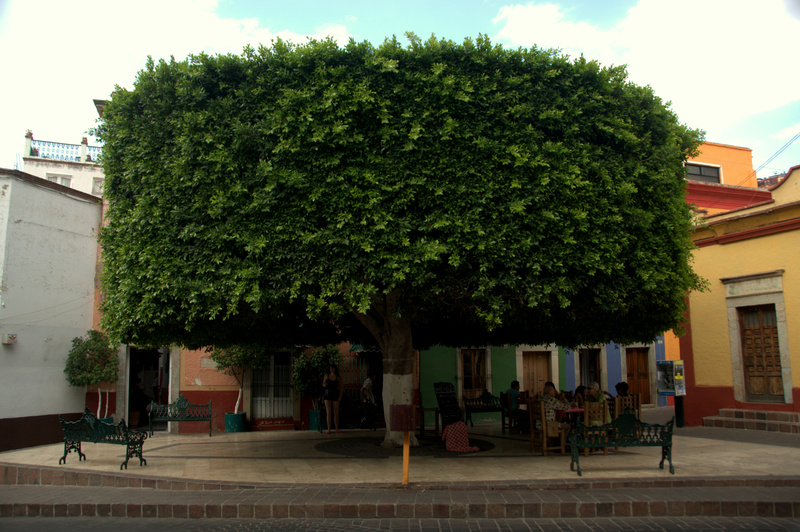 Later that same afternoon, we stumbled upon an unnamed plazuela (small square) dominated by an enormous, manicured laurel tree. The tree provided shade to patrons dining at the adjacent café, where we retreated for a snack of cerveza-y-papas (beer and hand-cut fries). Later still, we found a theater district sprinkled with statues of Don Quixote and Sancho Panza, no doubt in homage to the city’s annual Festival Internacional Cervantino, honoring Spanish author Miguel de Cervantes. Would I go back to Guanajuato? That’s the thing – I don’t know. Looking back, I was there in the company of a person whom I loved but who ultimately did not love me back. That being said, my five days in Guanas were still five of the best days of my traveling life. Although I generally enjoy re-visiting places from my travels, I’ve found with time that there are certain places – Venice and Florence, Edinburgh, Chiang Mai, New Orleans, Athens and the Greek Islands, Guanajuato – that I explored so well the first time, and that had such pitch-perfect ambience the first time that I hesitate to return. I guess my wariness is in fear that the magic won’t be there a second time. It’s been quite a few years since I have been there, but Guanajuato is probably my favorite colonial city in Mexico. I can understand your reluctance to return, but if you should go back there is one place you didn’t mention. It was a highlight of my last visit there… the ex-Hacienda San Gabriel de Barrera. This former colonial estate is on the edge of town, and belonged to a family that was descended from the owner of the Valenciana mine. It is now a museum. The house is filled with period furnishings. Even more spectacular, the grounds of the hacienda are now series of beautiful gardens. I spent a couple hours wandering the house and gardens, and taking loads of pictures.. Thanks for sharing your memories of that fascinating city. I’m not familiar with that place, William, but it sounds interesting. 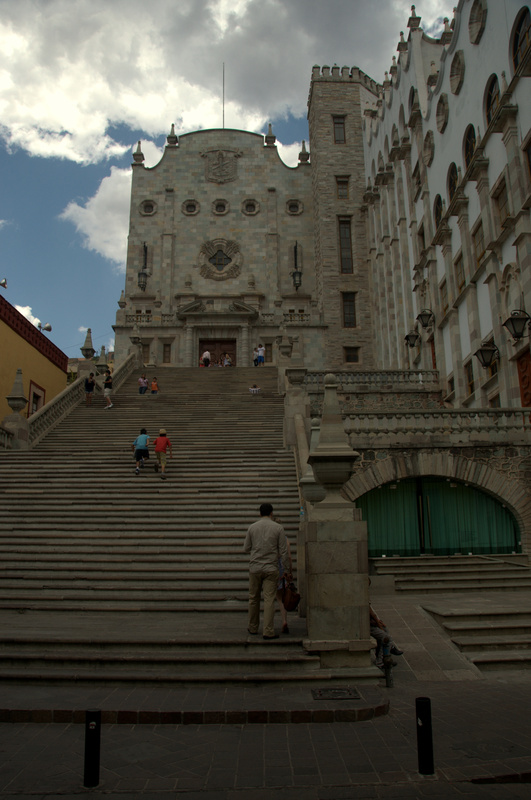 Thanks for the recommendation; there is still lots to see in Guanajuato State.